Danville is a distinctive, historic community noted for iron heritage and connections to health care. Local iron ore deposits fed the growth of a bustling iron industry in the mid and late 1800's. The rolling mill at the Montour Iron Works produced the first iron T-rail within the United States on October 8, 1845. Danville still celebrates its history during the annual Iron Heritage Festival held each July. Today, Danville is known as the home of Geisinger Health Systems and Cherokee Pharmaceuticals and is growing as an active community and center for healthy living and recreation. Historic architecture, friendly neighborhoods, and quaint shops await your discovery as you stroll through the streets of our community. Walking tour begins at the Montgomery House Museum at the corner of Bloom and Mill Streets and takes you through the heart of Danville's Historic District. The J. Manley Robbins Trail is a former railroad line for the "Montour," a 10-ton narrow gauge locomotive used for carrying iron ore betwen deposits and furnaces. The line was converted to a bicycle path in the 1890's, making it the oldest 'Rails to Trails' in the country. The trail now connects with additional trails and recreation amenities at the Hess Field Complex. This stone Federal House, now a museum, was built in 1792 for General William Montgomery and his family. Montgomery was a native of Chester County and a prominent figure in the early fight for independence from Britain. Danville, originally called Montgomery's Landing, was later renamed after the General's son. This historic park was originally the site of Danville's first cemetary. Its central feature is a 73-foot stone obelisk, which was built as a Civil War monument and was dedicated on Memorial Day in 1909; several other monuments dedicated to verterans of other wars are also found within the park. Today, the park is home to many events including concerts and plays. Mill Street is at the heart of the Danville business district, extending from the hills above the town to its riverfront. Flanked by well-preserved Italianate and Victorian architecture, it is bisected by historic Market Street and anchored by the Montgomery House, the Montour County Courthouse, and remnants of the North Branch of the Pennsylvania Canal. Montour Environmental Preserve offers a variety of educational and recreational opportunities, including hiking, nature observation and photography, boating and fishing, as well as hunting nearby. 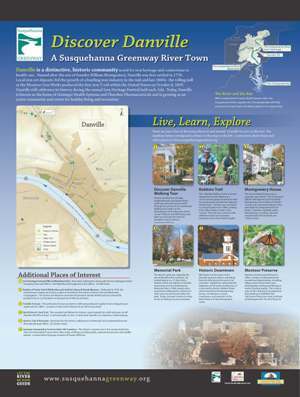 This is also a stop on the Audobon's Susquehanna River Birding and Wildlife Trail.